The Prado Washing is disturbing to look at. However the weird perspective derives from its original location on the right wall of the presbytery of San Marcuola in Venice. 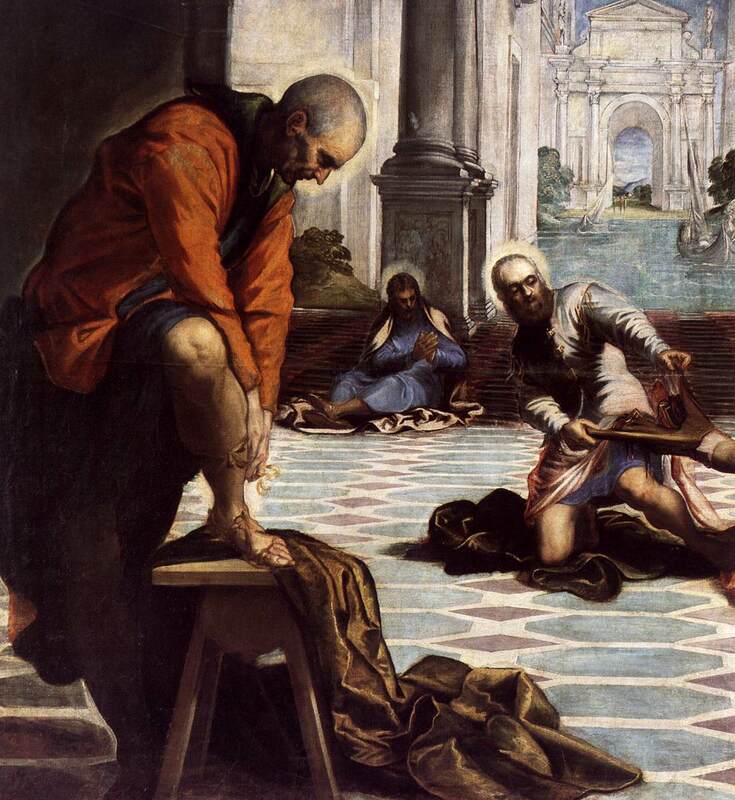 "the image of Christ washing Saint Peter's feet was on the part of the canvas closest to the congregation. When seen from the right, the painting is extraordinarily coherent. The dead spaces among the characters disappear and the composition appears ordered along a diagonal that begins with Christ and Saint Peter and continues along the table and the Apostles around it, to end at the Arch behind the canal, which is the work's true vanishing point." 20 Amen, amen, I say to you, whoever receives the one I send receives me, and whoever receives me receives the one who sent me." "
The act of washing another's feet was one that could not be required of the lowliest Jewish slave. Members of the Benedictine Order who followed the old Rule of St Benedict did it once per week It is said that the act was a religious one and was to be accompanied by prayers and psalmody, "for in our guests Christ Himself is honoured and received". "The Papists boast that, by Christ’s example, they observe the forty days’ fast, or Lent. But we ought first to see whether or not he intended to lay down his fast as an example that the disciples might conform to it as a rule. We read: nothing of this sort, and, therefore, the imitation of it is not less wicked than if they attempted to fly to heaven. Besides, when they ought to have followed Christ, they were not imitators, but apes. Every year they have a fashion of washing some people’s feet, as if it were a farce which they were playing on the stage; and so, when they have performed this idle and unmeaning ceremony, they think that they have fully discharged their duty, and reckon themselves at liberty to despise their brethren during the rest of the year. But — what is far worse — after having washed the feet of twelve men, they subject every member of Christ to cruel torture, and thus spit in Christ’s face. This display of buffoonery, therefore, is nothing else than a shameful mockery of Christ. At all events, Christ does not here enjoin an annual ceremony, but bids us be ready, throughout our whole life, to wash the feet of our brethren and neighbours." It is a long standing practice or discipline in the Catholic Church. 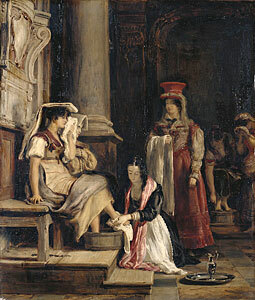 The washing of feet was in use at an early stage without relation to Holy Thursday, and was first prescribed for use on Holy Thursday by a 694 Council of Toledo. By the twelfth century it was found in the Roman liturgy as a separate service. Pope Pius V included this rite in his Roman Missal, placing it after the text of the Mass of the Lord's Supper. He did not make it part of the Mass, but indicated that it was to take place "at a suitable hour" after the stripping of the altars. One of the great exponents of the practice was Saint Pope Pius V whose tomb Pope Francis prayed before on the first full day of his pontificate. St. Pius joined to prayer assiduous mortification and large alms. He often visited the hospitals, washed the feet of the poor, kissed their ulcers, comforted them in their sufferings, and disposed them for a Christian death. 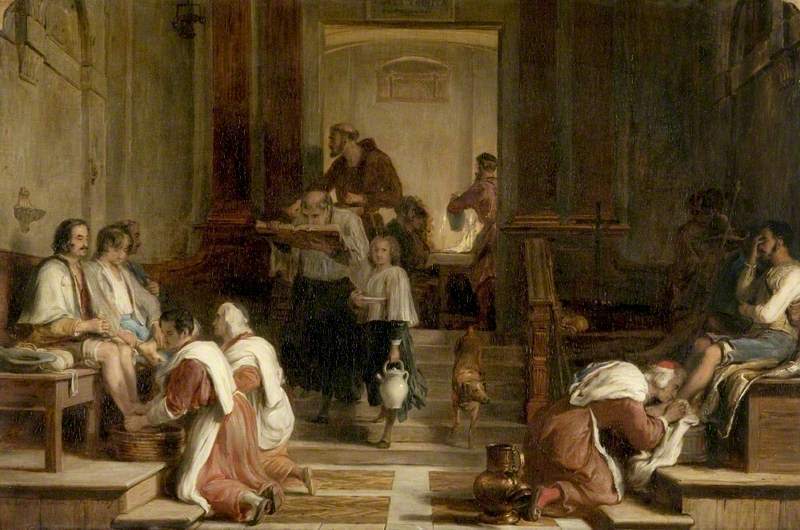 In his charity he visited the hospitals, and sat by the bedside of the sick, consoling them and preparing them to die. He washed the feet of the poor, and embraced the lepers. 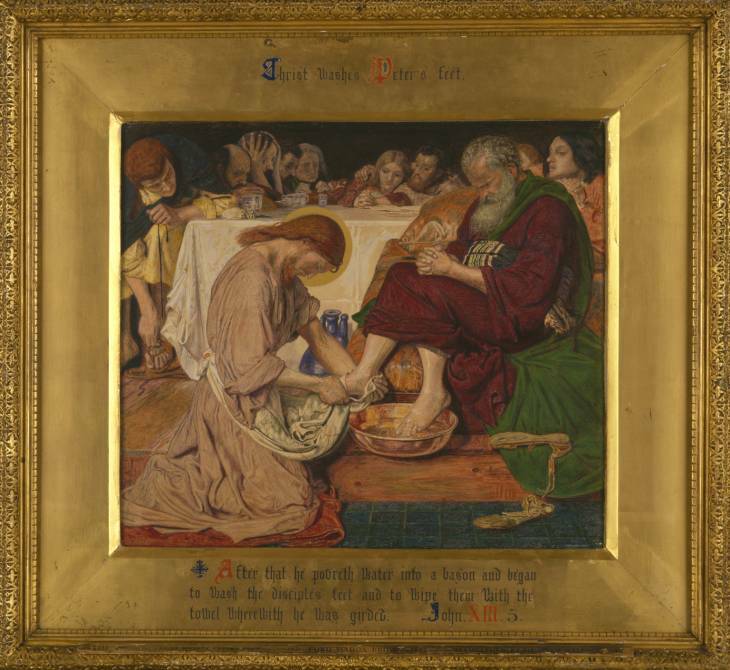 It is related that an English nobleman was converted on seeing him kiss the feet of a beggar covered with ulcers. He was very austere and banished luxury from his court, raised the standard of morality, laboured with his intimate friend, St. Charles Borromeo, to reform the clergy, obliged his bishops to reside in their dioceses, and the cardinals to lead lives of simplicity and piety. These were the only two Italian works which he brought back to London. The Gregorian melody was composed sometime between the fourth and tenth centuries. It is the Lord’s example: he is the most important, and he washes feet, because with us what is highest must be at the service of others. This is a symbol, it is a sign, right? Washing feet means: “I am at your service”. And with us too, don’t we have to wash each other’s feet day after day? But what does this mean? That all of us must help one another. Sometimes I am angry with someone or other … but… let it go, let it go, and if he or she asks you a favour, do it. Help one another: this is what Jesus teaches us and this what I am doing, and doing with all my heart, because it is my duty. As a priest and a bishop, I must be at your service. But it is a duty which comes from my heart: I love it. I love this and I love to do it because that is what the Lord has taught me to do. But you too, help one another: help one another always. One another. In this way, by helping one another, we will do some good. 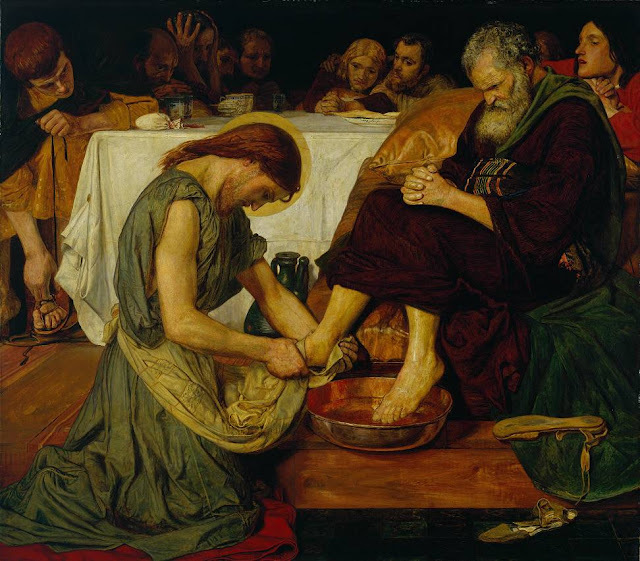 Now we will perform this ceremony of washing feet, and let us think, let each one of us think: “Am I really willing, willing to serve, to help others?”. Let us think about this, just this. And let us think that this sign is a caress of Jesus, which Jesus gives, because this is the real reason why Jesus came: to serve, to help us." "Christians are people who have been conquered by Christ’s love and accordingly, under the influence of that love – “Caritas Christi urget nos” (2 Cor 5:14) – they are profoundly open to loving their neighbour in concrete ways (cf. Deus Caritas Est, 33). This attitude arises primarily from the consciousness of being loved, forgiven, and even served by the Lord, who bends down to wash the feet of the Apostles and offers himself on the Cross to draw humanity into God’s love. " "If I then, your Lord and Teacher, have washed your feet, you also ought to wash one another's feet" (Jn 13: 14). We must wash one another's feet in the mutual daily service of love. But we must also wash one another's feet in the sense that we must forgive one another ever anew. The debt for which the Lord has pardoned us is always infinitely greater than all the debts that others can owe us (cf. Mt 18: 21-35). Holy Thursday exhorts us to this: not to allow resentment toward others to become a poison in the depths of the soul. It urges us to purify our memory constantly, forgiving one another whole-heartedly, washing one another's feet, to be able to go to God's banquet together." Amen. That last paragraph of Benedict's homily is so good, and enough to challenge us personally without looking for someone else - say, a new pontiff? - to criticize.